Northwest senior Laiken Rice with friends, family, and coaches at her signing day Wednesday afternoon. Northwest senior Laiken Rice signs her letter of intent to play softball at Kent State Wednesday afternoon. 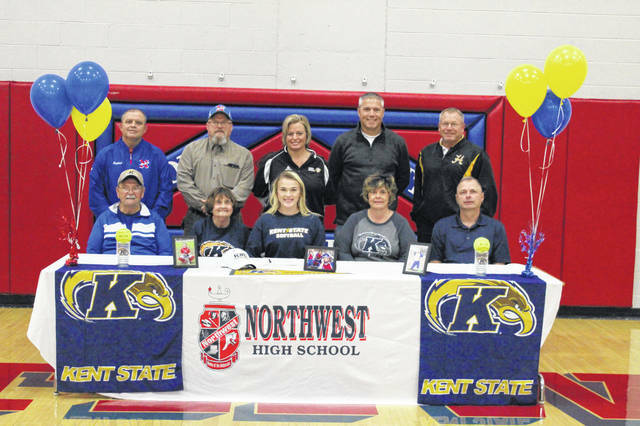 Laiken Rice, a senior at Northwest High School, signed her letter of intent to play softball for Division I Kent State University on Wednesday. Laiken has become well known throughout Southern Ohio for her abilities on the diamond while playing Little League, as well as travel ball with various teams such as Ohio Glory, Pride, and Southern Ohio Heat. During Rice’s freshman year for the Mohawks, she started varsity playing mostly at the catcher’s position, but also took on pitching duties to help her team over the years. She is known for being fierce at the plate, a smart baserunner, as well as an asset to any position in the field. Rice is the daughter of Larry and Lisa Rice of Lucasville, Ohio. Being the daughter of two teachers, Rice was raised with a quality work ethic in the classroom. She will graduate from high school in May 2019 with approximately 18 college credit hours, as well as having taken her high school courses her freshman and sophomore years, and currently holds a 3.9 GPA at Northwest. After signing her letter of intent to play for Kent State, Rice commented that the decision of where to go was a long process, and that she always liked the coaches there. https://www.portsmouth-dailytimes.com/wp-content/uploads/sites/28/2018/11/web1_IMG_2674.jpgNorthwest senior Laiken Rice with friends, family, and coaches at her signing day Wednesday afternoon. 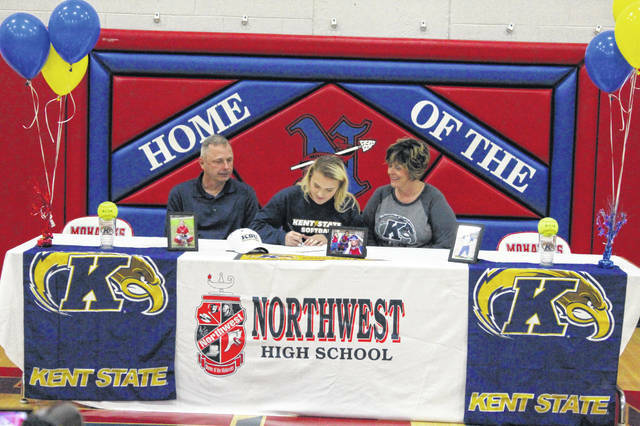 https://www.portsmouth-dailytimes.com/wp-content/uploads/sites/28/2018/11/web1_IMG_2675.jpgNorthwest senior Laiken Rice signs her letter of intent to play softball at Kent State Wednesday afternoon.